Property and Lawyering, and the Property courses of each of its authors Wilson Freyermuth and Jerry Organ, has been awarded the Center for Public Resources ("CRP: International Institute for Conflict Prevention and Resolution") 2002 Award for Promoting Problem Solving in Law Schools (CPR awards explained here). 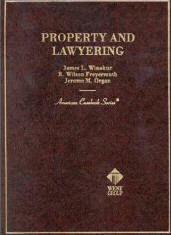 Winokur, American Property Law: Cases, History, Policy and Practice (Michie/Bobbs-Merrill/Lexis, 1982) (1296 pp). Choice, Consent and Citizenship in Common Interest Communities, in S. Barton & C. Silverman, Common Interest Communities: Private Government and the Public Interest (1994, Institute of Governmental Studies, University of California, Berkeley). Association-Administered Servitude Regimes: A Private Property Perspective, in Residential Community Associations: Private Governments in the Intergovernmental System? 85 (U.S. Advisory Commission on Intergovernmental Relations, 1989). Some Legal Aspects of Residential Mortgage Lending, , in Residential Lending Practices in Denver, Colorado 73 (Office of Policy Analysis , City of Denver) (1977) (with Marty Flahive). Ancient Strands Rewoven, or Fashioned Out Of Whole Cloth? : First Impressions of the Emerging Restatement of Servitudes 27 Connecticut Law Review 131 (1994) (as part of the University of Connecticut's Annual Gallivan Conference on Real Property Law, also featuring Restatement of Servitudes 3rd Reporter Prof. Susan French and Prof. Stewart Sterk). Community Associations Institute Research Foundation Symposium on Community Associations and Community, 36 St. Louis Law Journal 695 (1992, Winokur, ed.) (presentations of Profs. Gregory Alexander, Cornell Law School, and Winokur, with commentary). Meaner Lienor Community Associations: The Super Priority Lien and Related Reforms Under the Uniform Common Interest Ownership Act, 27 Wake Forest Law Review 353 (1992), in "Symposium on Uniform Land Acts," Prof. Marion Benfield, Symposium Chair. Reforming Servitude Regimes: Toward Associational Federalism and Community, 1990 Wisconsin Law Review 537. The Mixed Blessings of Promissory Servitudes: Toward Optimizing Economic Utility, Individual Liberty & Personal Identity, 1989 Wisconsin Law Review 1. Awarded 1989 Community Associations Institute Research Foundation Award for Excellence in Research on Community Associations. Articles on Abstract, Contract, Deed, Escrow, Lease and Title for The World Book Encyclopedia (1990). 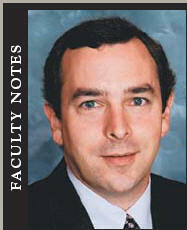 Daniel S. Hoffman: A Tribute, 62 Denver University Law Review 733 (1985). Consumer Product Safety: Preemption, The Commerce Clause and State Regulatory Authority, 25 Villanova Law Review 232 (1980) (with my student, the late Jennifer Robbins). This interdisciplinary research was funded by the University of Denver College of Law Hughes Research & Development Fund. Some Thoughts on Minimizing Legal Liability of Poison Control Centers, 12 Clinical Toxicology 319 (1978) (with my student, Robert Weiss). Corporations and the Public Interest - A Review of the Corporate Purpose and Business Judgment Rules, 27 Business Lawyer 235 (1971) (with Carroll R. Wetzel). Accountant's Liability for Nondisclosure of Post-Certification Discovery of Error, 116 University of Pennsylvania Law Review 500 (1968) (student note). Community Associations Case Law Reference (1994) (summaries of most or all community associations judicial decisions since late '70s, structured to streamline legal research in this field; transferred to Community Associations Institute ("CAI") and the Community Associations Institute Research Foundation).